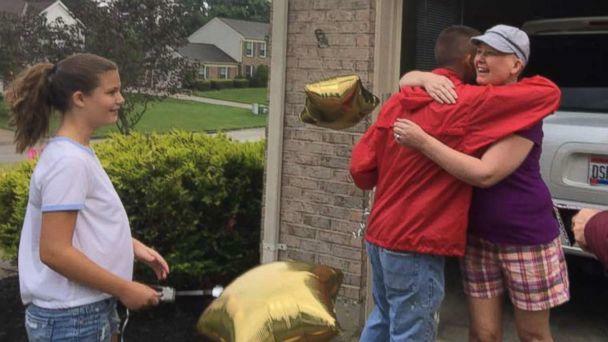 When Amy Kleiner walked outside her home in Cincinnati, Ohio, to leave for her final chemo treatment, she was greeted by quite the surprise. 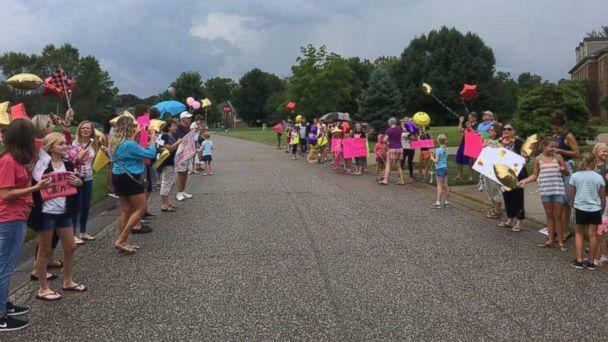 Her neighbor and best friend, Tera Kiser, had arranged a parade to mark the happy occasion. Kleiner’s husband, Doug Kleiner, and daughter were in on the surprise. 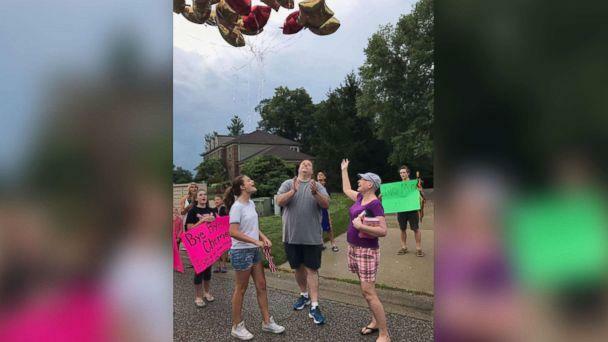 They were thrilled to help make her final treatment sendoff so meaningful, especially since it was the first chemo treatment since March 24 that her Doug could not attend. “My husband had taken me to every single one of them but he had a work function he couldn’t miss so Amy offered to take me," said Kleiner. "She decorated her van to go to my last hoorah. She called me and said, ‘I’m out in your driveway’ and when I opened my garage door, that’s what I found." 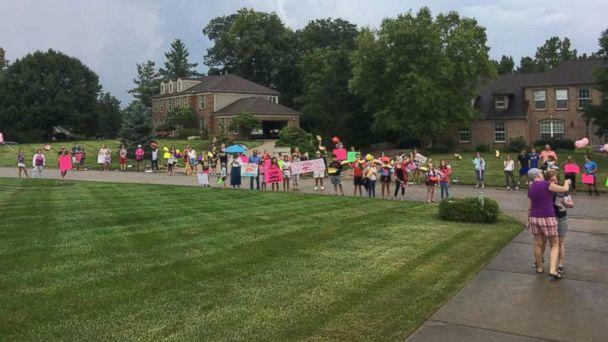 Neighbors, friends and family lined their street with balloons and signs showing their support. 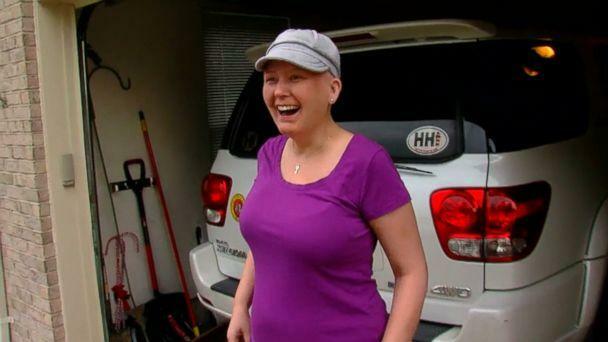 "She’s so selfless and so sweet, I just wanted to make it a big deal for her," said Kiser, 41. "More than anything else, I wanted her to know, ‘You’ve done it, this day is here and now we’re going to put this part of our day behind us and move forward. Let’s just go and get this last one treatment and get you feeling better.'" Kiser said Kleiner has been a fighter through her breast cancer journey, never once complaining about anything. "I’ve complained more with just a cold," said Kiser. “Any time someone you love gets diagnosed with something, but especially cancer, you feel so afraid for them. But you see the way she fought through it and said, ‘No, I’m going to get through this and be ok,’ I’m just blessed by her. That’s the truth." Before the two women got in the decorated van to whisk off to Kleiner’s final treatment at Mercy Health - Anderson Hospital’s oncology group, OHC, she thanked everyone who had come out in the rain on August 4 to celebrate her. "I got to go hug every single one of them," said Kleiner. She also released balloons into the sky, one for each of her treatments, to let go of that part of her life. "I still can’t believe this happened," Kleiner said. "It was definitely something I’ll never forget."